So far, the iOS 12 performance increases seem to living up to Apple's promises. Apple took to the WWDC stage to promise that iOS 12 would offer better performance than the iPhone’s current operating system. And tests on the first beta seem to bear this out, even on older devices. Side-by-side comparisons between iOS 12 beta 1 and version 11.4 show clear speed improvements. Benchmark scores show marginal increases. To determine real-world performance differences, iupdateos put an iPhone 8 with iOS 12 beta 1 next to a second iPhone 8 with iOS 11.4. The resulting video shows that the iOS 12 device is almost always quicker at running a variety of apps, both Apple’s own and third-party. 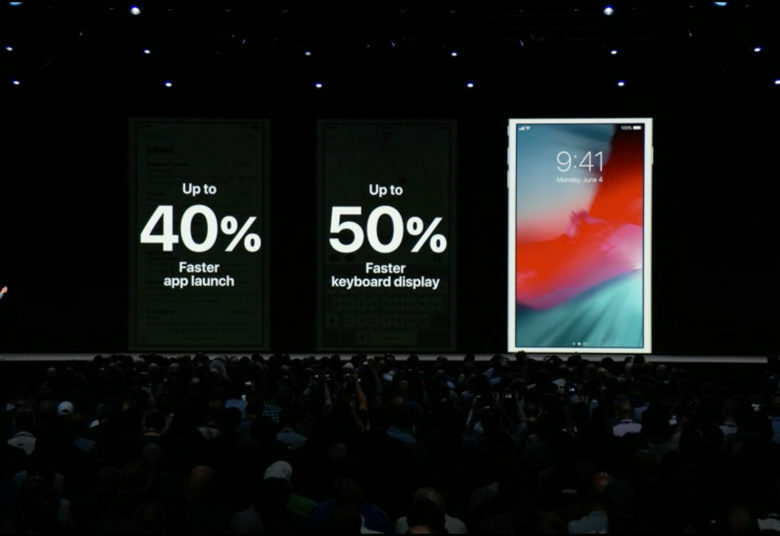 Apple specifically promised at WWDC that applications would launch up to 40 percent faster. This video doesn’t show speed increases that dramatic, but it’s early days for iOS 12. There was also a promise that opening the keyboard would be up to 50 percent faster. However, the side-by-side video shows the keyboard opening just as quickly under iOS 12 and iOS 11.4. In a Geeekbench test performed by iupdateos of an iPhone 8 with the new iOS 12 beta, the multi-core score was 10469, compared to the other iPhone 8’s score of 10073 while running iOS 114. It’s great that iOS 12 runs well on a nearly-new model, but what about something much older? Like the iPhone 5s. iAppleBytes did a side-by-side comparison with two of these 2013 devices. In this real-world test, the handset running the newest version booted up, and almost always launched applications, more quickly than iOS 11.4. And in this test, the iOS 12 keyboard did open significantly faster. On the Geekbench multi-core test, the unit running Apple’s new beta pulled down a 2265 score, compared to iOS 11’s 2223. S a virtual tie, demonstrating that benchmark tests don’t tell the whole story. And keep in mind, all these tests were performed on the very first developer-only beta of iOS 12. Companies typically don’t concentrate on speed improvements until later in the process. So Apple’s next operating system has a lot of potential. That said, time will tell if it lives up to its early promise.